Creamy, spreadable, and downright delicious, this keto bacon spinach dip is the perfect low carb appetizer, served with pork rinds or veggies! To the food processor or blender, add the soaked cashews, coconut milk, nutritional yeast, vinegar, salt, and spices. Blend until smooth. Meanwhile, sauté the spinach in the frying pan over medium-low heat just until wilted, about 30 seconds. Add the crumbled bacon and sautéed spinach to the food processor or blender. Pulse just until mixed. Transfer to a serving bowl and dig in! 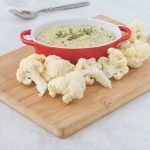 I’m sharing this recipe from page 255 of my paperback, The Keto Diet, because it’s creamy, spreadable, and absolutely delicious! Store it: keep in an airtight container in the fridge for up to 3 days. Prep ahead: prepare the bacon bits up to a month ahead of time and store them in the freezer in an airtight container. When ready to use, simply add the bacon bits as directed in Step 4, and use 3 tablespoons plus 1 teaspoon of bacon grease in Step 1. 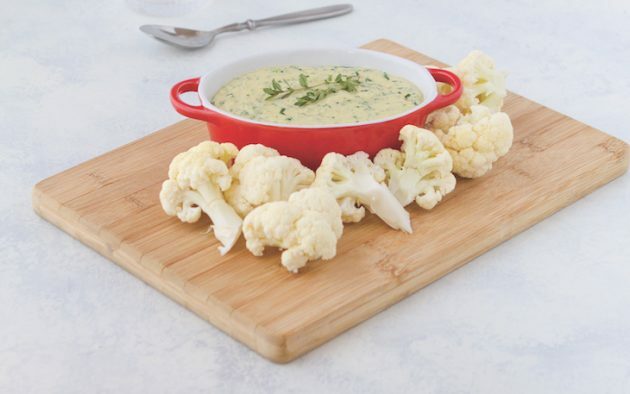 Serve with: pork rinds, steamed or raw low carb veggies. Make it coconut-free: replace the coconut milk with ½ cup (120 ml) of your favorite nondairy milk. Make it vegan: omit the bacon, add 3 tablespoons of refined avocado oil or olive oil, and replace the gray sea salt with finely ground smoked sea salt.